The acronym CTPM stands for a specific process - the proven way to build any business online to ensure success. Understanding this process while preparing your website content will enable you to successfully bridge the gap between offline and online commerce. Many people have never heard about this simple but vital process. 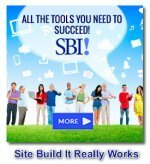 It is becoming more well-known these days, but it was made popular by Sitesell and their Site Build It online business building program. I've met many people who are wasting a lot of time and money trying to market their business online and getting nowhere fast. It doesn't have to be as hard as some people make it. Here is a testimony from one of them. "Six years ago I "put up a site" about my native country – Croatia. I wrote some articles, put some beautiful photos and videos. I wrote some blog posts and joined one or two affiliate programs... ...and nothing happened. I got some positive input from some of my friends, but nothing more! What did I do wrong? I just didn't understand and follow the C-T-P-M process. I had just ignored the "business" part of my online business website. I had wasted the whole year, hours and hours working on my site, losing hundreds of dollars in useless internet marketing and social networking programs. Perhaps you thought it takes magic or luck to be successful online. There's nothing mystical about it. People use the Web as a searching tool. They search for credible high-value information or solutions, anything that can help them solve a troublesome problem that they're experiencing. What Is The Most Common Mistake Made By Start-up Online Businesses? When someone decides to make a website for their business, they start at the end of the process - Monetization. They build sites about their businesses and their products and then are all set to sell (Monetize - collect the money). There is little or no Content... at least not the type of information that people seek. So what? In The CTPM Process Content Comes First! The Content has to be the cornerstone of your website. Only when you start with the C will you successful build income by delivering valuable content to your visitors and appetizing content to the Search Engine spiders. Content - Your visitor must get what they're looking for... the best information. Provide your website with original, high-value info. Remember that your visitor is not really seeking you or your business, but information that meets their needs. Your small business website has to deliver highly valuable content that will confirm in your visitor's mind that you are an "expert" they can trust and one who can solve their problems and needs. If you don't do this, your visitors simply click the back button to the Search Engine and says... "Next please!" Traffic - The Search Engines: If you don't contribute to the relevance and quality of their search results, sooner or later they will abandon you. But when your site provides info that is just what searchers want, you will be reworded by high SE positioning. Here is one example. Tomaz from vacuumwizard.com has created a high-value website about vacuum cleaners helping visitors in saving the time to research and select the best model for their needs. It's a good example of how to create a small business website following the road map of CTPM. Pre-sell to develop trust and confidence. Write content that engages your customers interest. Meet their needs, fulfill their wishes. Only relevant and high-value CONTENT creates an "open-to-buy" mindset in your clients and then, and only then, lead them to your final MONETIZATION offers. Monetization - Your advertisers and merchant partners: And finally, you've reached the final stage. Depending upon your monetization plans you start to make money. Your business partners want sales. You may already have your own products and/or services to offer from an offline business. Even so, you can diversify your monetize plans by using the Google AdSense program or becoming an affiliate partner with related products or services and receiving commissions. Regardless of your monetization mix, the best way to deliver results is through top content that gains your visitors' confidence. Then use "in-context" text links to recommend and direct those visitors to places that you believe deliver superb products with great value. Don't ignore your M possibilities if your business is local. Just take as an example a local asphalt-sealing business owned by Judd Burdon who, following CTPM process, began selling asphalt-sealing kits around the world. Local businesses can go global if you know the right road and have the right tools.